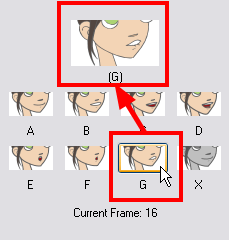 You can change the mouth position assigned to a frame if you think another position is more appropriate. For example, you may have a character who says nothing for 10 frames between two speeches. Animate Pro would normally assign an X image for the silent period. However, if you want your character's mouth to hang open in astonishment for these 10 frames, you can change the lip assignment for these frames from an X to an F.
1. Right-click in the cell that contains the mouth position you want to change. 2. From the pop-up menu, select Lip-Sync > Change Mouth Shape to and choose the letter that reflects the mouth position you want to use for that sound. You can also select Animation > Lip-Sync > Lip-Sync > the desired mouth shape from the top menu. The drawing is automatically updated in the Camera view. You can also change the mouth assignment of a sound in the Sound Element editor. 2. In the Sound Element panel, drag the frame slider to the frame you want to change the mouth position assignment on. In the Lip-sync image area, the image on top represents the lip position assigned to the current frame. 3. To change the image assigned to the frame, click on the image of the mouth position you want from below the preview image. The preview image changes to the mouth position image you select. You can perform the same operation in the Layer Properties view. The position is updated in the Timeline and Xsheet views.